Finally the buns are baked in the oven, then finished with a sugar glaze. 1. Combine flour, salt and sugar in a bowl, then rub in butter until the mixture resembles breadcrumbs and sprinkle in the dried yeast. Make a well in the centre and add the warm water and milk (I warmed my milk slightly to help activate the yeast, although the original recipe doesn’t call for this). Add the eggs and bring the mixture together into a wet dough. 2. Knead the dough for about 10 minutes, then place in a lightly oiled bowl, cover and leave to rise for an hour. Then place the dough in the fridge for a further 30 minutes. 3. On a lightly floured surface, knock the dough back and roll into a rectangle about 12″ x 17″ – it should be about 1/2″ thick. 4. Mix together the cinnamon and the brown sugar. 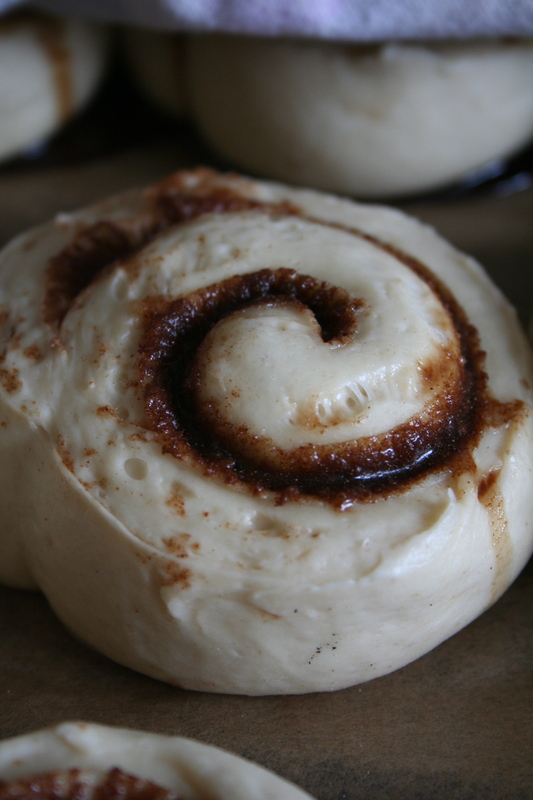 Mist the dough with a little water and then sprinkle over the cinnamon sugar so that the dough is covered with a generous layer. 5. 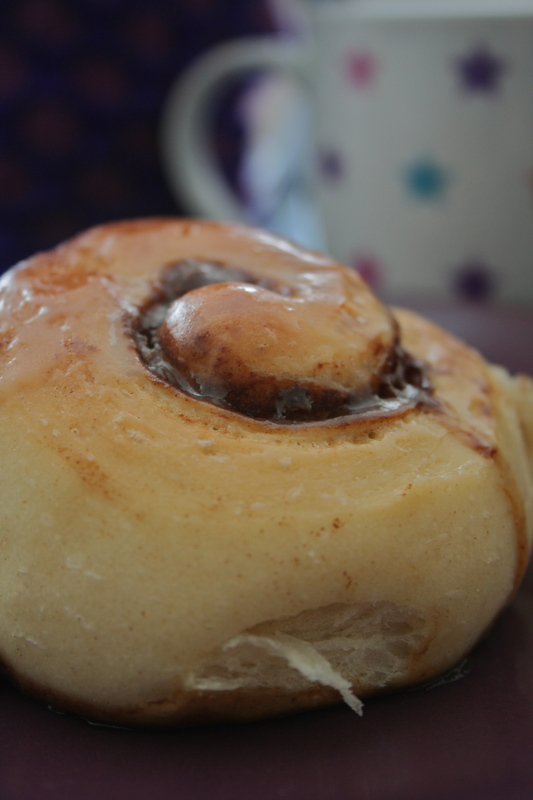 Roll the dough tightly into a swiss roll – brush the seam with a little water to make sure that it sticks. 3. Preheat the oven to 190°C and bake for about 15 minutes, until the swirls are lightly golden. 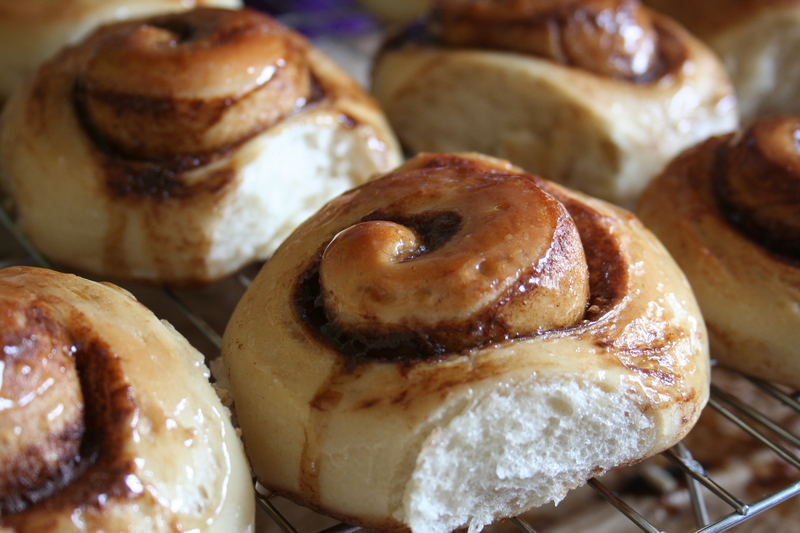 (You can brush the buns with an egg wash before you bake them – I omitted this step). 4. 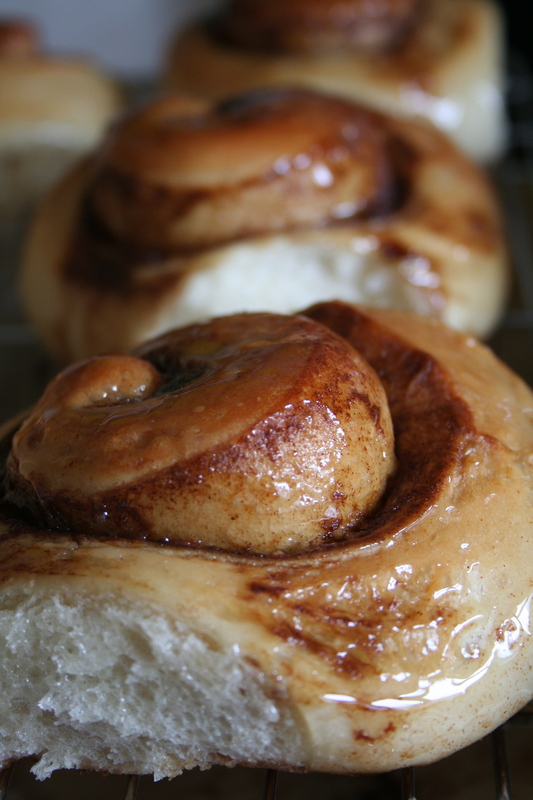 Place the buns on a wire rack to cool and brush with the sugar glaze (see below) whilst still warm. 1. Heat water and sugar together in a saucepan until the mixture starts to thicken to a syrupy consistency. ~ by smileysoyabean on 12 May 2012.